Heading 8 kilometers west out of Marmora, and two kilometers north on Blairton Road will take you to the west shores of Crowe Lake, and the remains of the thriving iron mining town of Blairton. Beside the Blairton trailer park are the old iron ore pits, completely grown over, hardly traceable, yet a reminder of thebooming dreams of long gone iron masters and railway entrepreneurs. The area now is cottage country with a few permanent homes, with not a trace of its former glory. "Apart from the hucksters, the Town presented an idyllic image. Blairton was beautifully and skilfully laid out by the late John Damble, on high ground of hard sandy soil, the streets descending in all directions. Mud is never seen here, hence one can walk out in slippers after the heaviest rain and never get their feet wet. The scenery of Crowe Lake with its islands, coves and points, is, to say the least, picturesque in the highest degree." It was not just nature and Town design that marked Blairton. For it was, says Aunger, "a place of harmony and concord," and certainly most respectable. Indeed the former site manager claimed, "there was a quiet vying as to the claim of rank with the "upper crust" of society." The Town was declared as a prolific spot for "match-making" and matrimony. "The settlement of Blairton (after 1867) had grown into a bustling little community. Named after a Scottish settler it boasted a railroad station, telegraph office, three general stores, two hotels and sundry blacksmith shops. No fewer than eleven streets had been laid and the population had increased rapidly to a total of five hundred. This was considered to be a sufficient number of people to warrant the expense of establishing a post office. Permission was granted by the Crown and the Blairton Post Office was opened on August 19, 1867 by local resident Roger Bates. The very existence of Blairton was due to the discovery of iron ore, resulting in a mine that became the largest producer of iron in Ontario (called Canada West from 1841 until 1867). The lower pit today, visible on Crowe Lake Shoreline. Records show the company enthusiastically laid out a town site in an H shape, with a population of 800 and 40 company homes, boarding houses for the singles, two hotels and 4 stores,and the usual boot leggers. Only the lots for the store and hotel were sold, the compnay retaiing the rest. Two lots were given for a church and parsonage. The local school had 2 teachers and an enrollment of 100. On Sundays, there were a dozen Sunday School teachers busy. The fame of the small settlement was widespread. Men with their families travelled from Britain and Europe heading for Blairton, to work in the mine. With these workers came settlers hoping to make their fortunes by using their talents plying their trades; wagon wheels had to be made, plow handles carved and food grown and distributed. These newcomers to Canada found new opportunities but also new dangers. "Two Englishmen, Arthur Jones and William Futcher were killed instantly in the "derrick pit" by iron ore falling on them from the hoisting basket over 100 feet above their heads." wrote John Aunger, manager. to allow scows to go under and so receive the ore dumped from the scows. soon recovered, but life was extinct." In 1865 the Marmora Foundry Company re-acquired the mine but permitted operations to remain idle for a further two years. The whole structure of the iron business in Canada and in particular Hastings County, began to crumble. Presumably financing was still the number one difficulty, for it was once again virtually impossible to find reliable investors who were willing to take the tremendous gamble. However, in the autumn of 1866, the importance of the iron deposit at Blairton was brought to the attention of some wealthy American businessmen interested in the iron trade. After testing the area, they offered to take part in a purchase of the lands resulting in the formation of the Cobourg, Peterborough, Marmora Railroad and Mining Company. This joint venture became effective the following year. The total capital raised amounted to better than half a million dollars. Americans from Pittsburg invested four hundred and thirty thousand, and Edward Burstall of Quebec offered to raise about seventy thousand. The new company began operating in the Spring of 1867. John Laskey Aunger of Marmora was hired to fill the important position of overseer and bookkeeper at the mine in its first year of operation under the name of the C.P.M. Railroad and Mining Company. His job entailed finding a sufficient number of men to provide two regular shifts and remain on call when not on duty. John's grandson Robert resided until recentlyon the family farm located between Blairton and Marmora. Back in 1867, the year of the mine re-opening, an unidentified news reporter wrote, "Some idea of the amount of work being done at the Marmora iron mine may be formed from the fact that the sound of blasting can be heard at both Eldorado and Madoc, a distance of about twenty five miles or so. Two kegs of powder are used each day and four forges are kept busy just sharpening drill bits. " The article went on, "Each drill penetrates a foot before it becomes dull enough to require honing, while in the contrast of mining gold, the bit can drill only two or three inches before returning to the forge. Development has been rapid and Marmora, the village whose destiny is inextricably forged with iron, may yet attain to some importance". The main pit covered about an acre of ground and was 125 feet deep while the deepest point in the lower mine was only about 60 feet. The hill above the lower mine near the lake was a favourite observation site, especially on a sunday afternoon. There are many names carved in the stone on this hill. The first and largest of the three general stores in the settlement was owned by Thomas Claskey and stood on the corner of the main intersection of Queen and King streets. The first and largest of the hotels, owned by William Bowen, was situated directly across the road. Two boarding houses and several livery stables made up the balance of the business establishments." "As one emerges from the swamp and enters the village it is apparent the houses are quite new, constructed of unpainted wood but very comfortable. The mining company has erected no fewer than forty dwellings for their employees. In addition there are boarding houses, hotels, stores, butcher and shoe shops. Altogether Blairton is probably ahead of any other village of its age in Canada". Blairton's future looked bright indeed, but its destiny was fully dependent on the fortunes of the mine. Although the supply of ore seemed abundant, assuring prosperity for the community, the fluctuation of foreign markets was beyond the control of the owners. The mine was operated, with occasional closures, for a total of fifty-four years before its final collapse. Word was passed to the crew, "Due to overstock in the United States, suspension of all activity appears to be reasonable". "The miners work over the face of a huge mass of iron ore. They drive their drills with heavy hammers, pounding and tamping to coax the powder deep into the holes. At the base of the wall the ore is lying in rugged masses, varying from a few pounds to several tons. The men break this down with sledges, then wheel it up in the tramway to the top of a massive pile". "The population of Blairton is about one hundred. It has two stores, kept by Thos. Caskey and Wm. Armstrong; a post-office; a hotel, kept by J. F. Purdy; and two blacksmith shops. The school of No. 9 school section is in this village. There is also a Methodist church. Blairton is not nearly as prosperous as it was when the iron mine in its vicinity was being worked, but the opening of the Ontario and Quebec Railway will, it is hoped, restore things to their former state. The Village of Havelock, which is about seven miles east of Norwood, has a post-office, a store, a blacksmith shop, a carriage, shop, and the school of school section No. 6. "Prinevu's," between Havelock and Blairton, is a post-office, established in May of the present year. It has a hotel and store kept by Napoleon Prinevu, and a blacksmith shop. It is only five hundred yards north of the line of the Ontario and Quebec Railway. There are also post-offices at Rush Point and Round Lake." A railway station was built at Blairton, which was served by a branch of the Great North Western Telegraph Co". A few of the last operators were Emma, Annie and Belle Aunger and Lizzie McLaughlin. "Cobourg, Peterborough and Marmora Railway and Mining Company ... Wanted immediately ... 400 quarrymen, miners and labourers to whom permanent employment will be given at the company's ore bed in Blairton and at the works office in Marmora ... Apply Mr. Bently". Even after hiring Swiss miners through England, and French Canadians from Quebec, along with all available local men, they were still desperate for a full crew, both skilled and unskilled. For the second time a letter was sent to London promising high wages in addition to free boat passage if men would come and work in the Marmora mine. A similar letter was mailed to Camborne, England the next day. The overseer was paid a monthly salary of $42.50 and the drillers (who also handled the dynamite) received $36.00 a month. SIedgers had an average pay of $34.50 and cullers and labourers earned within a range of fifty cents a day up to $1.50, for a monthly average of twenty dollars. George Wellman was one of the labourers then on the mine payroll. He worked twenty days in October and earned (at fifty cents a day) ten dollars. He spent one day thrashing on the overseer's farm and earned an extra seventy-five cents. George paid the company a dollar a month rental for his cabin and was allowed to deduct two dollars for erecting a six-foot partition in one room. In total he earned $14.80 out of which he spent sixty cents for material, leaving him a clear$14.20 for the entire month's work. The miners, with few exceptions, rented their dwellings from the company at a dollar a month. To supplement their income they worked on their days off at odd jobs, perhaps building an ice house for a dollar and a half, or cutting thistles along the railway tracks for fifty cents. With their wages every little bit extra helped. To give an example of the cost of real estate, John Aunger sold a house to Mr. Kitchen for eight dollars entering a notation in his books that it was, "badly wrecked and plundered". A two-room cabin was sold to I.F. Young and the notation read, "much wrecked, all he would give was ten dollars" .A stone house went to Mr. Petherick for fifteen, and the condition of the place was, "middlin good". The next place sold for the same amount and the remark was, "about true value". When Thomas McQuay purchased a house for ten dollars it was noted that his was, "the best offer out of six". An Ottawa correspondent for the Canadian News Service in London England wrote on August 19,1867, "The iron at Marmora Canada is progressing well. I hear about one hundred and fifty French Canadians have been brought from Quebec along with some Swiss miners, swelling the payroll to three hundred men. The ore is inexhaustible. It is sent to Cobourg to fill the thirsty holds of some fifty vessels". One ship called the "Mary Taylor" with Captain Ewart commanding, had the distinctive honour of delivering the first cargo of ore across Lake Ontario to Erie, Pennsylvania, U.S.A. To gain insight into the lives of the pioneer miners, one has only to read the payroll or cash rental books dated the month of August 1874. There were five categories of workers; the overseer, drillers, sledgers, cullers and labourers. "We had one address on the way, as we passed through the lock at Hastings. The Reeve there was a most amusing old man, and told us he had been waiting fifty years for a nobleman to come and see him. The final object of our expedition was an iron mine, and we had to go a short way in a train to reach it. I did not expect to care the least about it. We have seen so many untidy, stony, barren places called mines; but this one was an interesting sight. We found ourselves at the top of an enormous hole or cavern (these words are too small for it), 140 feet deep, perfectly open, and light as day. The men looked like imps as they worked below, and it was the sort of thing one sees represented, in miniature, in a fairy play. " Total tonnage for May 11, 1868 is 2,188. Balance stored in pile number six. 382 tons shipped on the schooner Pintago May 29, 1868 at 2.30 p.m. from Belleville. July 19, 1867 total tonnage 3,338. Balance stored in pile number eight. 401 gross tons shipped on the schooner Fullerton from Trenton. July 30, 1.867 total tonnage 7,417. Balance stored in pile number two. 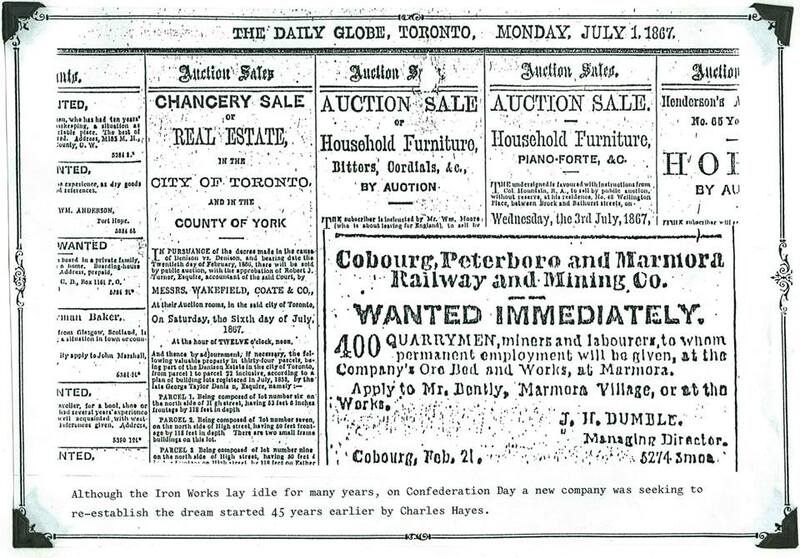 284 tons shipped on the Eureka July 31, 1867 from Cobourg. 334 tons shipped on the John L. Cross August 20, 1867 from Picton. 305 tons shipped on the Anil Henry July 30, 1867 from Belleville. Then the unthinkable happened. A disastrous blow was dealt to the industry as a whole and to Marmora in particular. A rich deposit of excellent quality iron ore was discovered in Michigan, U.S.A. pushing the existing Canadian operations into the back- ground. The iron trade became unstable and money exceptionally scarce. Hastings County lost her once reliable customers in the U.S.
Stringency was the password in every branch of the industry. Material that had been purchased for the expansion of the Marmora railroad was piling up in the company yard. For the next six years the company shipped less than half its capacity. In 1874 mining crews were dispersed, machinery was tossed on the open market and the property was sold at a loss. Blairton houses fell vacant and hotels emptied. The report to the Royal Commission of 1890 states, "The mine situated on lots seven and eight of the first concession of Belmont township, was closed due to lack of sufficient buyers for the product of iron ore". The Peterborough Examiner exclaimed, "Three hundred miners laid off in Belmont township leaving a ghost town behind. The little village of Blairton on the west side of Crowe Lake was a humming community of about seven hundred souls. Now it has become a memory waiting once again for a monotonous winter". When the mine closed permanently in 1874, the population dropped dramatically to less than fifty in the first six months. Long after the mines had closed and the Village had begun to disintegrate, optimists still saw hope. In 1907 it was reported that "a shaft 185 feet deep was sent down some rods from the old surface work." The Marmora Herald heralded a rebirth. "As a result of these recent discoveries real estate around Blairton is becoming valuable. The citizens are expecting a revival of the former activity for their village, and they believe it to be coming in the not distant future." Not so, wrote an anonymous contributer the next week. He set out to set the record straight. First of all, it was not an 185 foot shaft, it was just a drill hole. The notion that a rebirth of Blairton was just around the corner was just "a gratuitous assertionclothed in grandeloquence". Unfortunately, he was right. Thomas Caskey continued running the post office until his death in 1912. By then the population had dwindled to about 25. The post office and Methodist church (later United Church) both lasted until 1929, when they were shut down for good. The Marmora Herald in 1927 listed Mr. R. Donald Buchanan as the local school teacher. • The Blairton Iron Mine is located on the south shore of Crowe Lake approximately 7 km west of Marmora. A short roadservicing the Blairton Mobile Home Campground, 2 km north of Highway 7, provides access to the site. plagioclase, with coarse grained magnetite abundant. There are two lenses of magnetite present. The main lens is approximately 700 feet long and 50 feet in width. Reserves were calculated in 1914 by Lindeman at 1.8 million tons. On the top of the mountain of ore in Blairton is a clearing overgrown with poison ivy andlowbushes. Here wasa site frequented by picnicers and attendees atrevival meetingswho left their mark in the rock. Under the ivy and mosslies a collection of inscriptions including the First Commndment - "Thou shalt have no other gods before me"
COBOURG, PETERBOROUGH, AND MARMORA RAlLWAY AND MINING COMPANY.